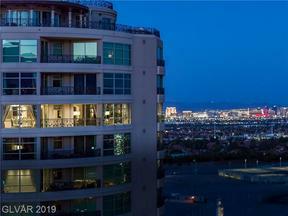 Queensridge Towers, also known as “One Queensridge Place”, is one of the premier high rise buildings in all of Las Vegas. 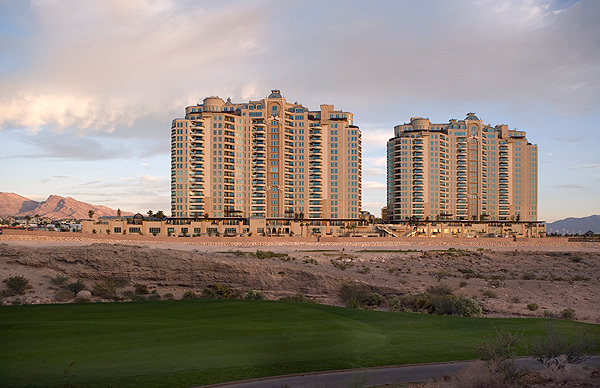 While most of the high rise condos are located near & on the strip, One Queensridge Place is the only high rise located adjacent to the award winning Summerlin masterplan, surrounded by the TPC Canyons Course to the west, and the Badlands Course to the east. With Tivoli Village and Boca Park just minutes away, residents have numerous dining and shopping options, which makes the location very desirable. Designed and built by Executive Home Builders, the developers really wanted to create a maintenance free lifestyle with a “custom home in the sky” feeling. The smallest sized luxury condo starts at 2000 sq. ft, and they go up to the 14,000 sq. 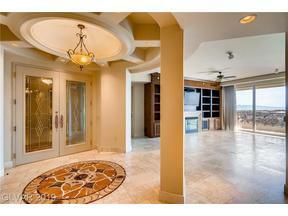 ft crown jewel 2 story penthouse. Units that are sized from 2600+ sq. ft feature elevators that open directly to your own residence. 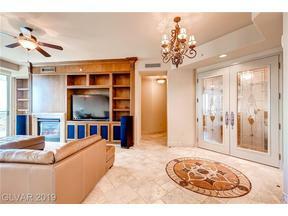 Each unit also comes with a 2 car private garage, within the confines of the parking garage. Quality abounds in One Queensridge Place, from the imported stone used throughout the building, to the mosaic tile inlaid elevators, to the manicured grounds. Amenities are plentiful and include: guard gated entry, concierge, indoor pool, outdoor pool, state of the art fitness center, card room, billiards room, theater room, library, roman spa, and a resident’s lounge where you can enjoy tea/coffee/smoothies/continental breakfast daily. HOA dues run $2100/M.